Last week, I finally reached the sushi promised land. Since I’ve moved here, Uchi has consistently held a reputation for “the best month’s paycheck you’ll ever spend in one sitting.” It was a Japanese holy land that I would possibly never reach due to the current state of my finances. It was this mysterious, beautiful creature whose glory was not mine to bask in. Fortunately, much like many beautiful, expensive things in Austin, there is a loophole for us po’ folks. That loophole is the Uchi happy hour. 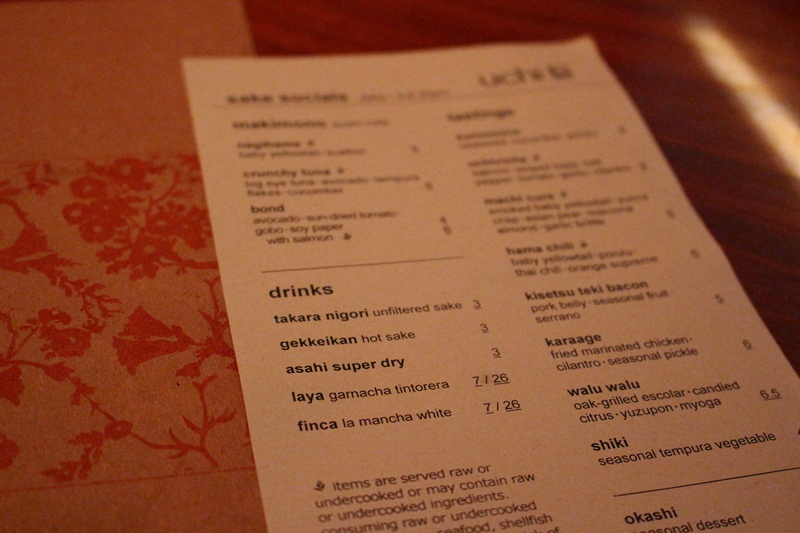 From 5 to 6:30 daily, Uchi opens its doors to my people. You have to get there early—4:45 is smart—to secure a spot in the rather expansive restaurant. You are then free to roam about the delightful little garden, a mini-South-Lamar-oasis, until 5 or simply stand awkwardly at the bar and wait for the drinks to become slightly more affordable. We chose the latter. With sushi holding a very esteemed spot on Marc’s favorite food list, he was perhaps more excited than I. Sushi is hard to find in Austin and it’s a damn shame. If it were up to me, I’d take out a quarter of the taco places and throw in some half price sushi spots. Please don’t crucify me for saying this, Texas; it needed to be said. 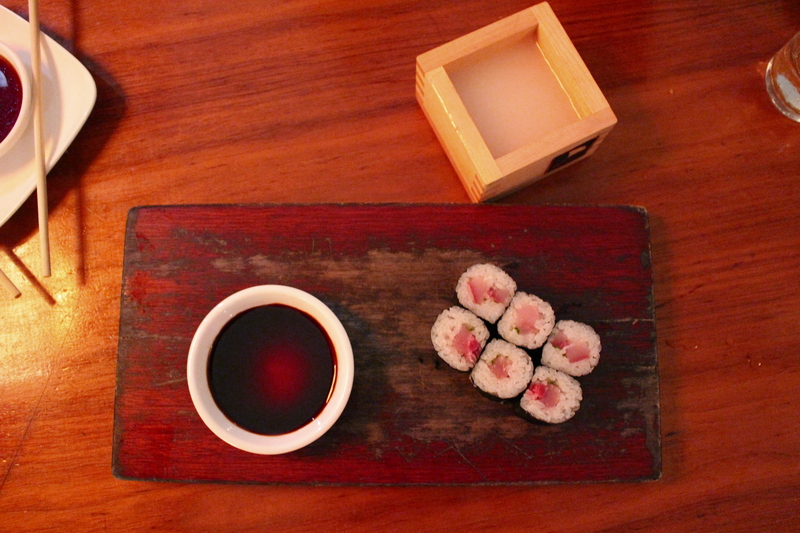 Uchi’s happy hour has its own tiny menu with 3 categories of specials: sushi rolls, “tastings” and drinks. 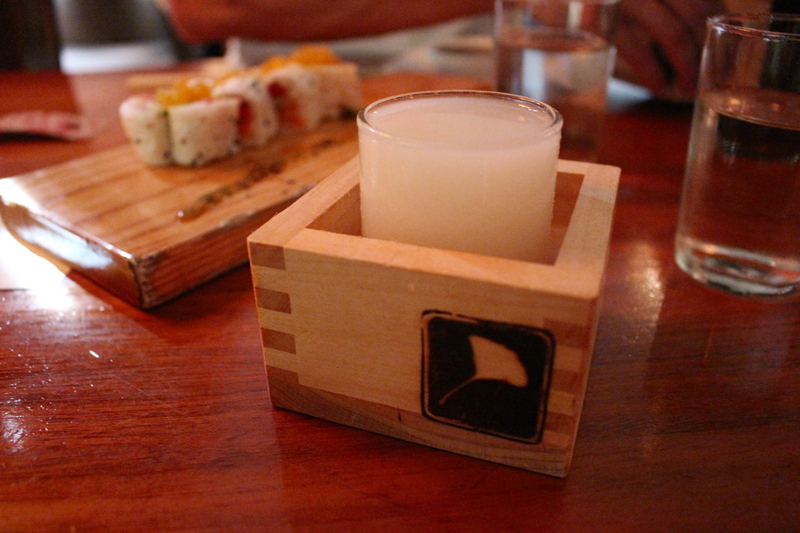 We started, of course, with sake ($3), which at Uchi is served in square wooden cups. Marc has a trip to Japan under his belt and assured me that this is, in fact, how you’re supposed to drink sake. And I loved it. And I loved the price even more. 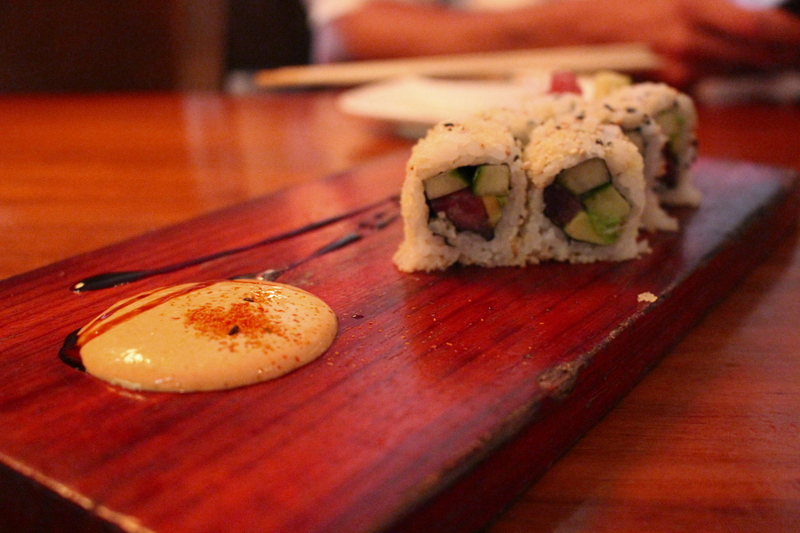 We had been told that the way to order at Uchi is to let your server be your guide. Fortunately for us, we were almost instantly confident that our server (Chris) not only knew what he was talking about but also had our very best interests in mind. He didn’t stop smiling for our entire visit. He didn’t try to sell us anything; he simply explained the dishes in perfect detail and convinced us that there were certain things we just HAD to try. So we did. The food ranged from good to spectacular. Everything is 1) incredibly fresh 2) perfectly seasoned and 3) tiny in portion size. They have soy sauce on the tables there, but you won’t need it. The flavors are all on point, and some things stick their necks out more aggressively than others. Our happy hour feast began with the bond roll ($6 at happy hour), a beautifully presented salmon roll covered in roe and wrapped in delicate soy paper. Was it spectacular? No. But it tasted fresh and whet our appetites for what would come next. Our next dish was so stupid playful I almost laughed with joy. 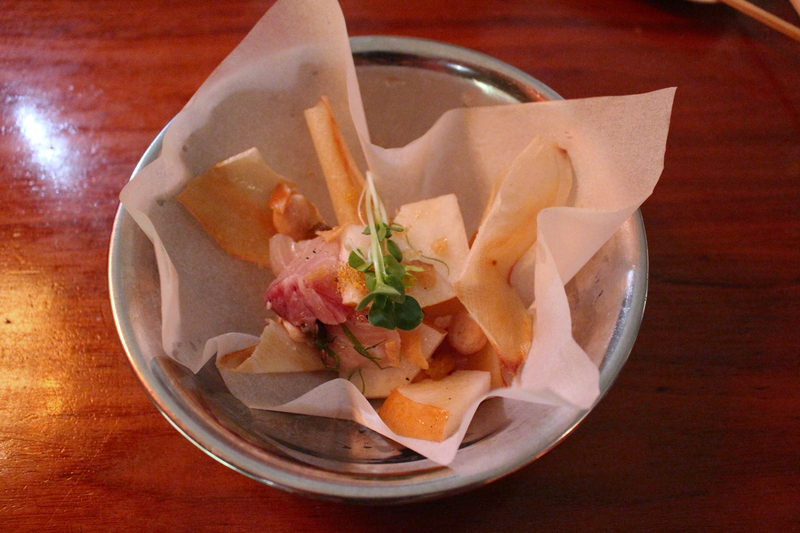 The chefs at Uchi put together a tasting of yucca crisps (crunchy vegetable chips), smoked baby yellowtail, Asian pear, marcona almonds and garlic brittle to make something that tasted different with every bite. It was kind of like a sophisticated and extra fresh chips and salsa with an Asian edge. The dishes continued to come out in that same pattern: sushi, tasting, sushi, tasting. If there’s one thing we learned from our happy hour experience at Uchi, it’s that there’s a reason why Uchi’s tastings can run for $18 or more on a regular night: they completely and totally steal the show. Don’t get me wrong, the sushi was fantastic. 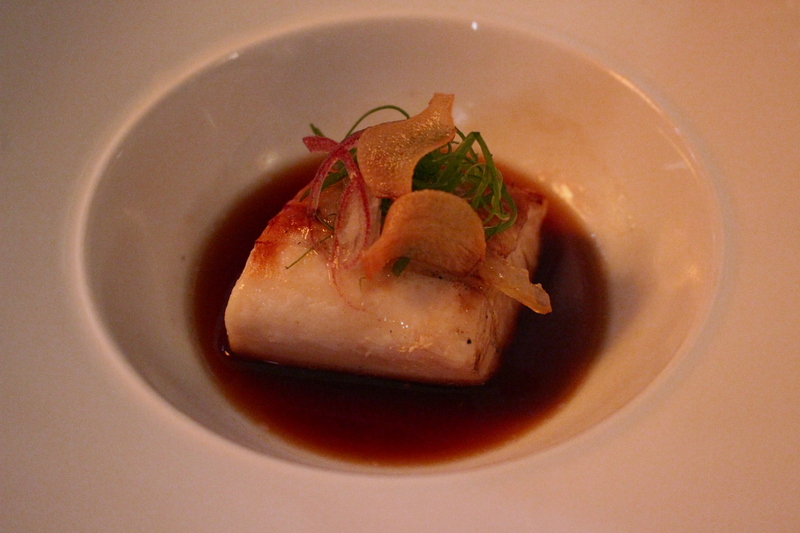 But Uchi’s tastings–dishes like the one pictured above–are painfully good. Fall to the ground and weep kind of good. The walu walu, a delightful combination of escolar, candied citrus, yuzupon (a Japanese vinegar) and myoga (Japanese ginger), is one of the most perfect peices of fish I have had in a very long time. The vinegar at the bottom asks as a delicate broth for the flaky fish; the candied orange adds the tiny bit of sweetness to a delectably savory dish. It was fantastic. Our two other tastings were equally enticing and proved that Uchi’s kitchen is capable of a variety of preparations. 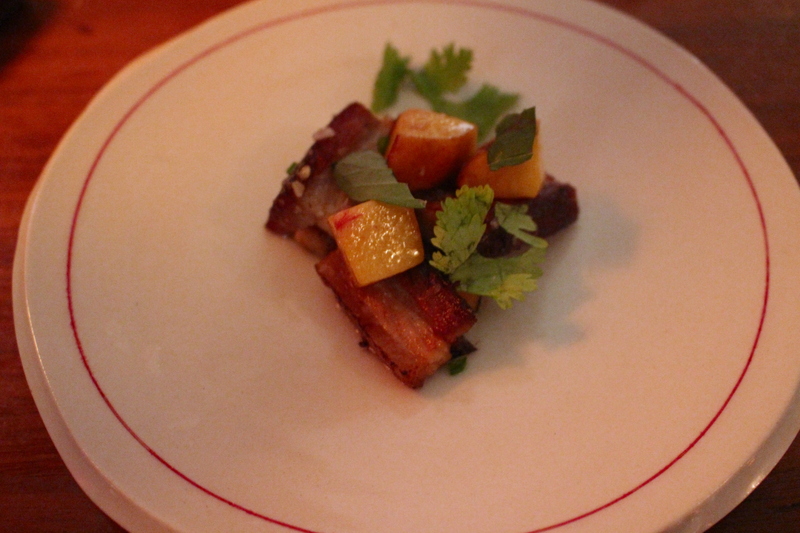 They served us a piece of pork belly of the highest quality and cooked it to the perfect balance of crunch and tenderness. 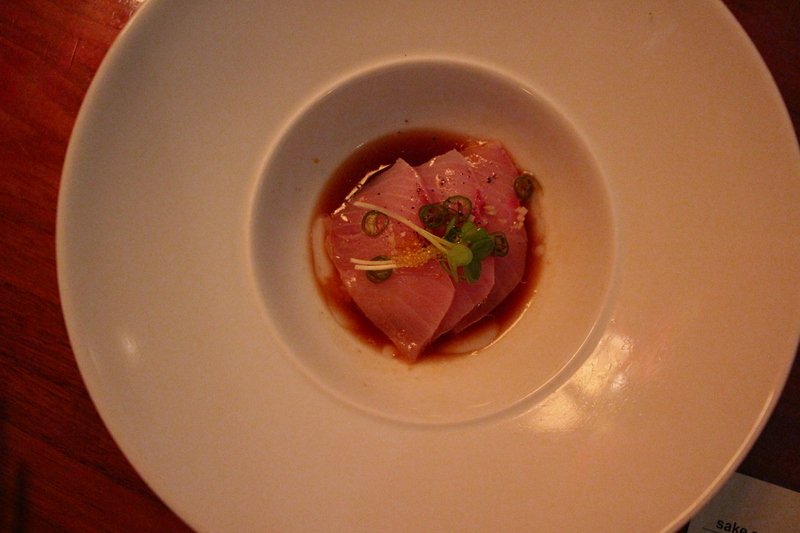 The delicate slices of raw yellowtail in the hama chili tasting needed little accompaniment to bring out their flavor. It’s important that I don’t ignore the sushi rolls in this post. The two pictured above, especially the crunchy tuna roll, were delicious and well worth the $6 price tag. When it comes to happy hour, however, it just seems to make more sense to order from the tasting menu. The options are simply more diverse. To make sure that we were doing justice to Uchi’s renowned sushi roll menu (accurately referred to as makimono), we ordered the most interesting sounding one on the menu, the hakujin roll. 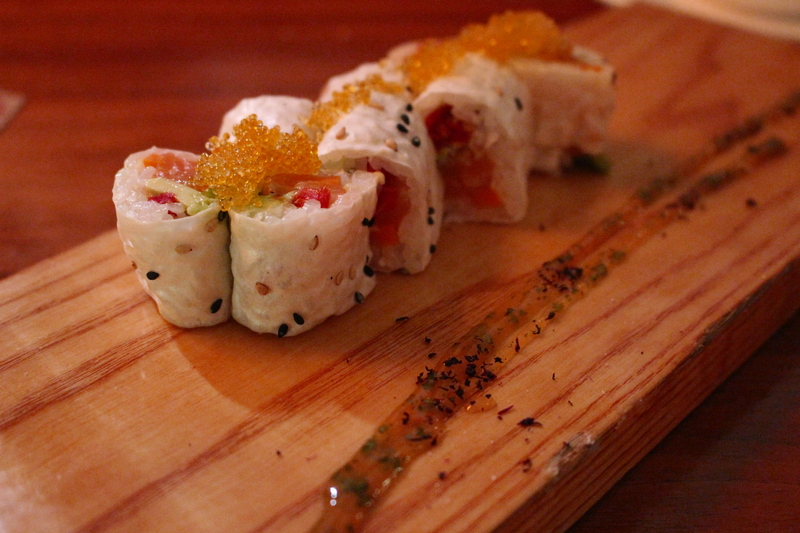 This roll, like the others, was clean, fresh and in need of no other accompaniment than what was provided. (Our bottle of soy sauce was super lonely that night.) 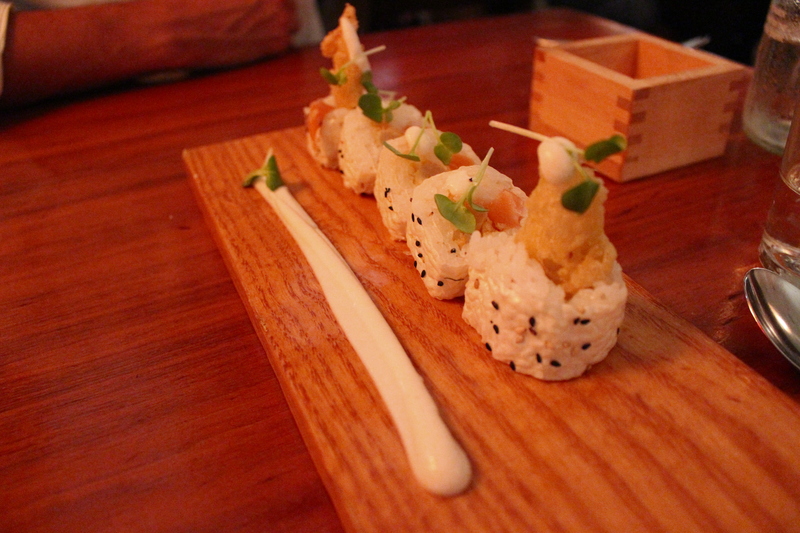 The little crunch from the tempura combined with the sweetness of the pear and the creaminess of the cauliflower was like nothing else we’d ever tasted, especially in a sushi roll. 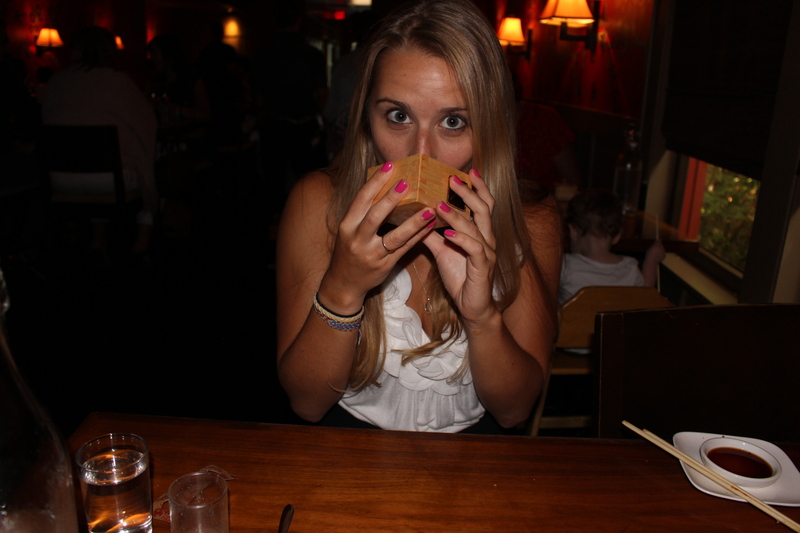 Three wooden cups of sake and a packed-to-the-brim restaurant later, we left Uchi a little buzzed and a lot happy. I wouldn’t use the word “full” to describe our tummies at that point, but I definitely wasn’t hungry. We spent about 40 bucks a person at a place that would normally have us in tears over the bill, and that alone was enough to satisfy us.